I believe that those of us who are called into a mid-life crisis and those who accept the honor of moving through it thoroughly and with grace are the lucky ones. Now that I am on the other side, I see my mid-life crisis as a true breakthrough, an awakening, and the path to the peaceful, joyful, and loving life I am living now. Have you ever been in a conversation where someone says "oh, he's just going through a mid-life crisis." And then everyone laughs, we say we understand (because actually deep down we do), and we move on as if it was all just a joke? 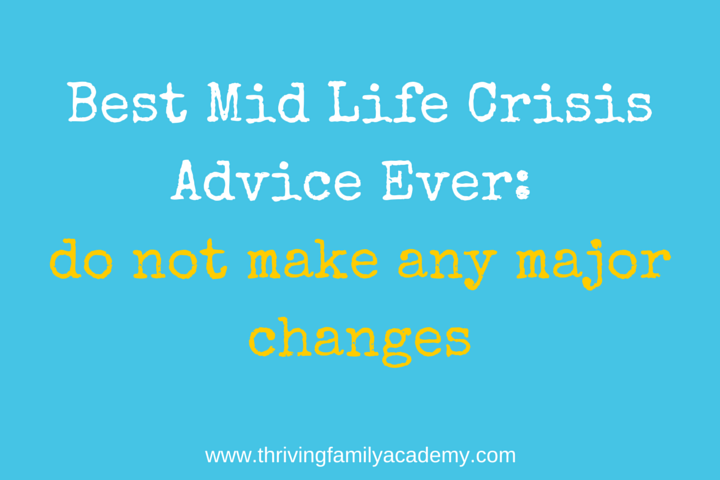 Based on my experience as a woman on the other side of my own mid-life crisis and observing my clients and friends, mid-life crisis is not a joke. It's a real transitional phase of life (and highly functional, too). It's easier to laugh and brush it off and use mid-life crisis as an attempt to ignore what is really going on. It's common to put the blame on someone else. And it's less scary to just look from the outside and judge their actions and thoughts as impulsive or foolish instead of facing the fears that are being stirred up inside us. When someone is going through a mid-life crisis, it's not a time to mess around (literally and figuratively). Seriously, if you are in a relationship with someone going through a mid-life crisis, pay attention. Or if you suspect you are going through a mid-life crisis, take it seriously. When I was called into my mid-life crisis, I wanted drastic change and I was in serious distress. I wanted to leave my marriage, move away, have another baby...all at the same time. I remember sitting outside of couple's therapy freaking out and typing "mid-life crisis" into the google search on my phone. 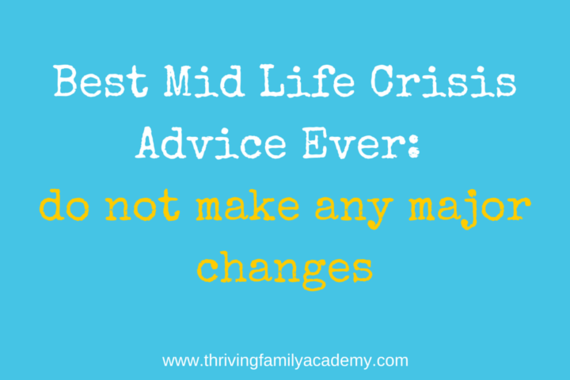 What came up was "When you are in a mid-life crisis, do not make major changes." I hung onto those words for months and months because the urge was real and it was powerful. It helped me to resist doing something that I might later regret. If you or your partner did not get the "don't make major changes" memo, there may be a massive impulse to do something drastic lurking and perhaps no one is talking about it yet. Or worse yet, one of you might be listening to that impulse and planning a major change. Denial is the most dangerous phase of a mid-life crisis. The urge to do something drastic might feel really powerful and you will often feel like you are sure you need to listen to the urge. But I encourage you to wait as long as you can before you take any action and work with a professional who can help you see your situation more objectively. Believe me, I know that it feels like an external change is necessary but what is really happening is you are being asked to stop looking outside of yourself for solutions and to turn inward. Maybe it's sort of a rebirth. A chance to create your life in a way that is more in alignment with who you really are, rather than what other people have put upon you as who you should be over the years. It's a time to expand your life...like a second "growing up." So, the upside to a mid-life crisis is that it is an opportunity for growth, to get more conscious, to intentionally bring more meaning into our lives, and to find ourselves hidden beneath all of our conditioning and false beliefs. A gift for sure. And yet, while in the midst of it, it feels more like being trapped in a nightmare with a dark storm looming. Don't be judgmental. If the one in crisis has an unfulfilled dream from childhood they are seeking to fulfill at this time in their lives and there is no material harm in doing it, try to be supportive where you can. The less judgmental you can be, the more likely you can keep open communications during this time. Respect what's really going on here. We all feel a little afraid at the mid-life point. We fear we are never going to be who we thought we would be, have the life we imagined, ever have fun again, be as successful as we hoped, have the money we need for retirement, etc. We might not know exactly what's going on, but be sensitive and compassionate to the reality that there is more going on than meets the eye. Pay attention. Check in with each other. What do you need? What does your partner need? It's a time for attention and focus and a tender heart. Be sensitive to each person. It's common for the partner to feel left out, betrayed, afraid, upset, confused and helpless and their feelings and experience are important too. The person going through the midlife crisis might feel misunderstood, helpless, out of control, and afraid. Get help. A coach, counselor, or therapist can help you through this in a way that is least destructive and most helpful. Reach out. If that is not an option, talk to supportive friends, read books, and/or find a community who can help you. And yet don't take it too seriously. It's okay to still laugh and do fun things! It's good to take this as a time to rebuild your connection and bring joy into your life. If we take it too seriously, we might believe the fears and stay afraid of change. It's a great time to mix things up, have a little fun, and bring some adventure into your life! Above all, be gentle. This too shall pass. It will pass more gracefully and completely if everyone is gentle and loving and gives the space necessary to get through this time. Deb Blum helps parents to embrace parenthood as a spiritual and healing journey because if the parents are doing well, kids naturally thrive. Her website and blog, the Thriving Family Academy, offers online courses, coaching and tools for parents who are curious about or committed to doing their inner work to heal and grow.